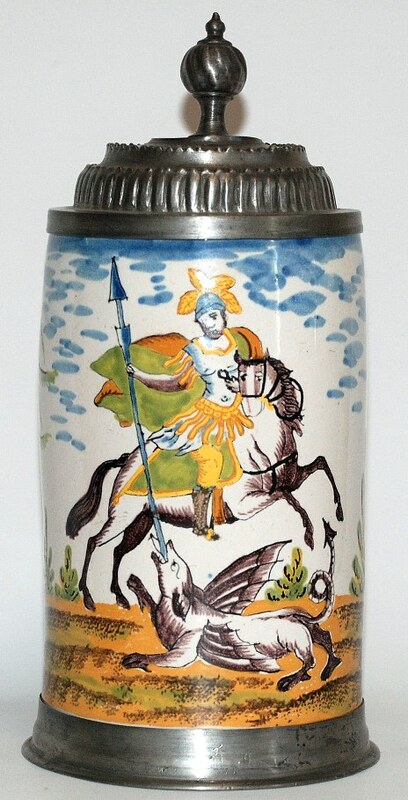 IDENTIFYING FAIENCE STEINS – PART 7 – CRAILSHEIM (1715-1827). 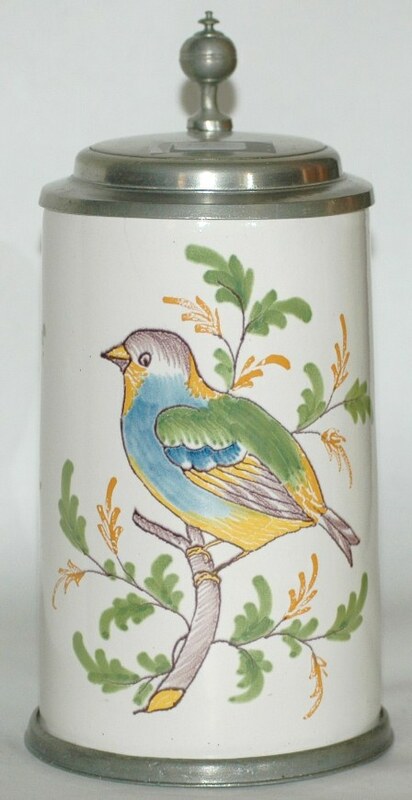 Crailsheim is located in the Württemberg region of Germany along with the other faience factories of Schrezheim, Ludwigsburg, and Göppingen. The first owner is believed to be Georg Veit Weiss, who died in 1769 and his son Johann Georg then took over the factory. 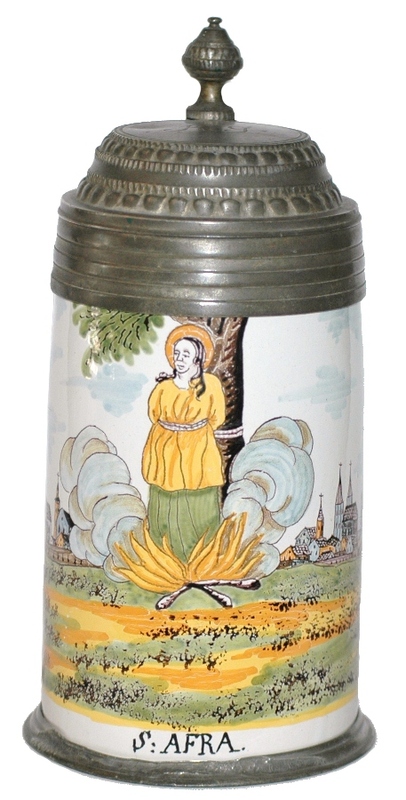 After his death, his wife ran the faience factory but she quickly remarried and her second husband Johann Friedrich Schäfer ran the factory until his death in 1827. 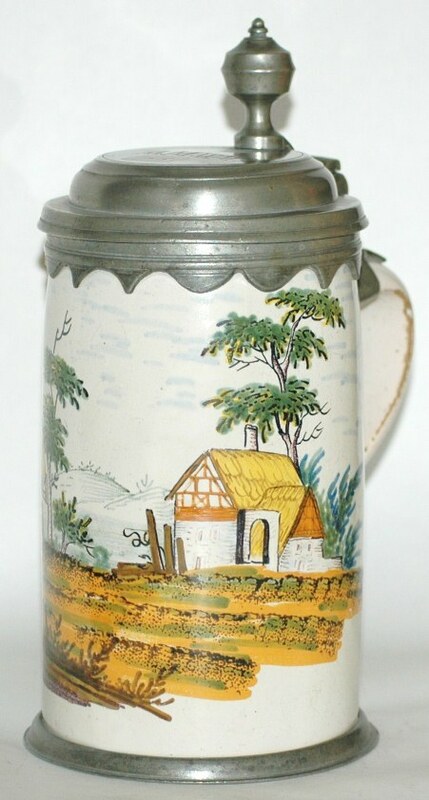 The stein body is typical South German style with a straight side to the body with NO indentation at the top and with a flare at the base of the stein where a foot ring is usually attached. Figure 1 shows a typical Crailsheim stein. 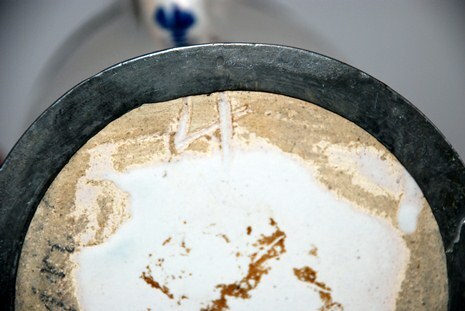 As mentioned above, the base of the stein usually has a foot ring that goes around the flared base. Because of the flared base design these base rings remain attached to the stein, unlike the northern factory piece were the pewter bases are off missing. 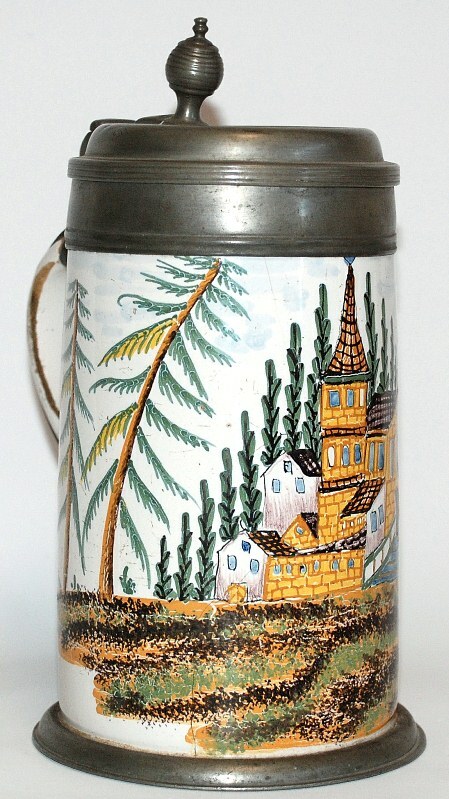 Usually the top of the stein will only have a pewter lid but just as often you can find Crailsheim steins with a lid ring. 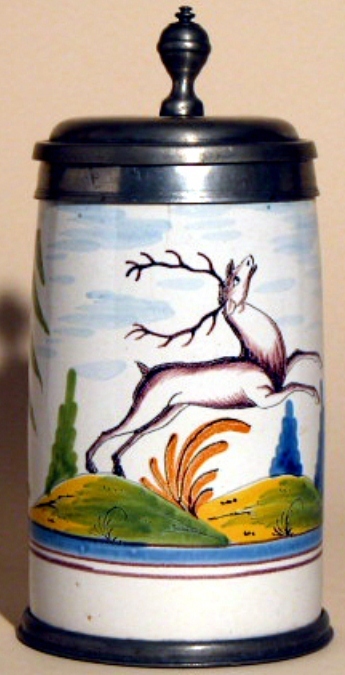 Figure 2 shows a stein with just a lid and Figure 3 shows an example of a stein with a lid ring. 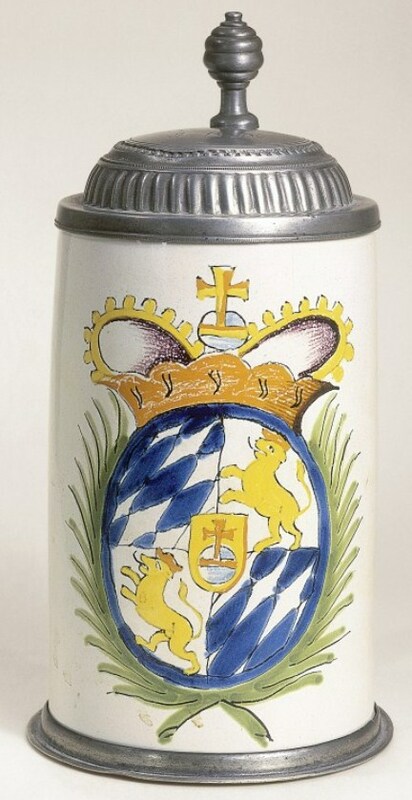 Crailsheim steins can be easily identified by their handle. The handles have a cross section of a D, are flat or slightly concave on the inside, and round on the outside. They are usually slightly tapered from top to bottom. 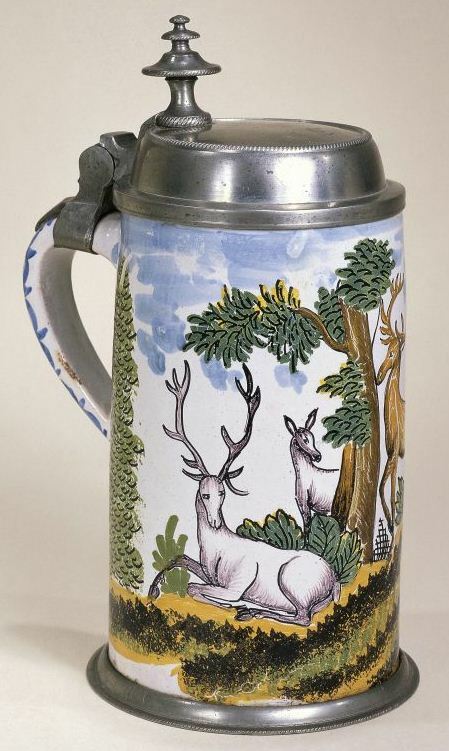 But, it is the lower handle attachment that unique to these steins. 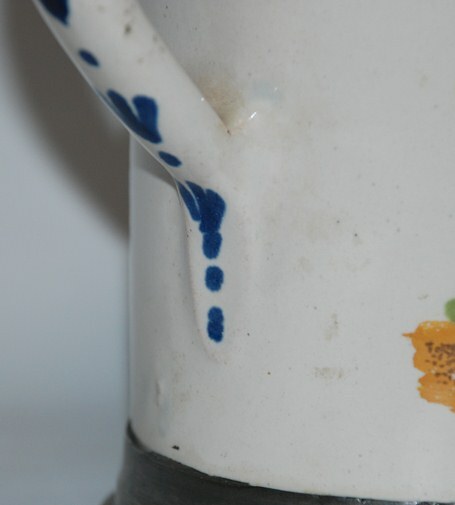 The lower handle attachment has a flat thumb mark which makes the handle attachment just slightly raised from the stein body as can be seen in Figure 4. If you slide your thumb down the lower handle attachment you can see how the potter used his thumb in attaching the lower end of the handle to the stein body. 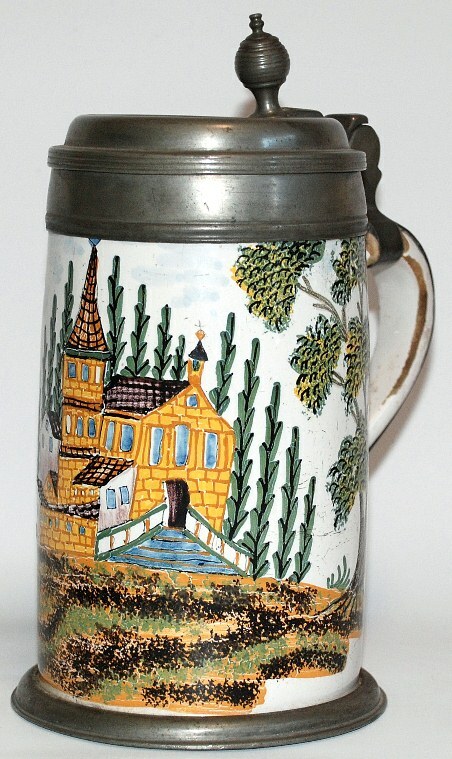 Crailsheim steins usually do not have any factory mark and it is rare that you will find them with the factory name Crailsheim on the bottom. Sometimes you will find a number scratched into the bottom of the stein (which may be a size number). Figure 5 shows one of these numbers (a 4) scratched in the bottom. Crailsheim is best known for their “yellow family” decoration (painted with egg-yolk yellow in high temperature colors). The paintings in these decorations are usually of a very high quality. The colors are very bright and are dominated by yellow or an orange/yellow along with green, blue and magenta. 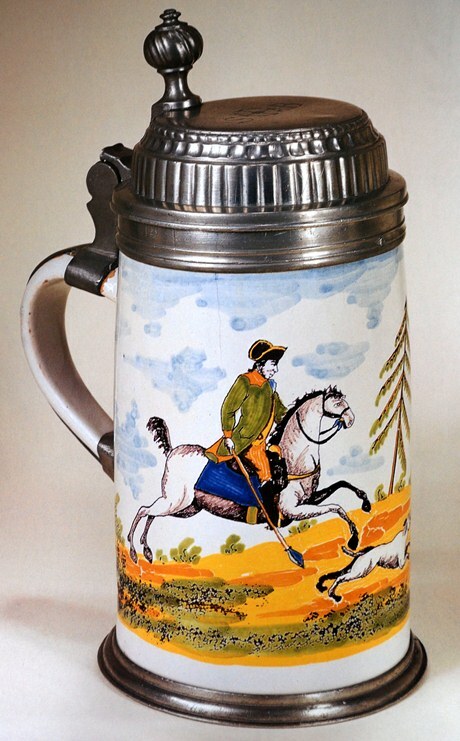 Once you see several of the steins you can easily identify this decoration. 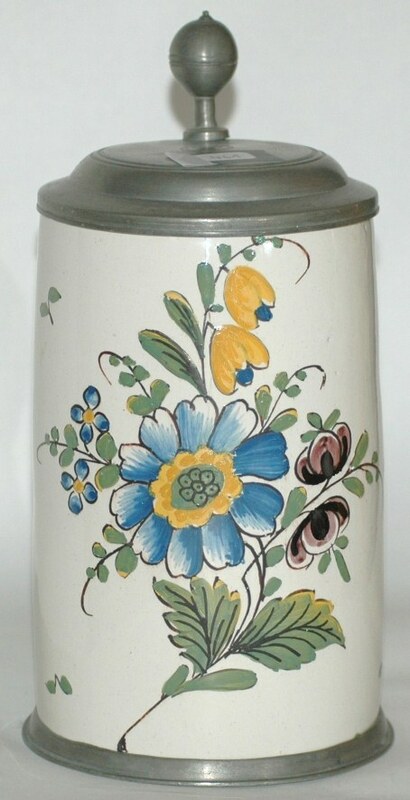 Figure 6 ▲, shows a typical “yellow family” stein and you will see many more of these in the photographs at the end of this article. 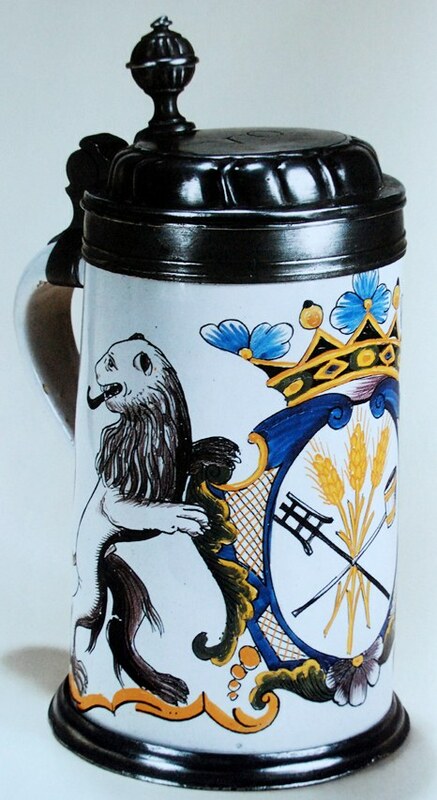 Also, Crailsheim made steins with colored glazes, usually in yellow or turquoise. An example is shown in Figure 3. Thanks to Ron Fox in supplying many of the photos used in this article.